Just recently, I was asked to give a presentation to a civic group so lively it refused to accept defeat after a decade of bureaucratic foot-dragging by the local council: the Friends of the CC Museum. Founded in a century-old school in the 1950’s by the formidable Dr James Richardson LLD FSSA, Inspector of Ancient Monuments, “bespectacled, 6 feet tall, big-boned but very slim, and slightly stooped in conversation with those of lesser height” North Berwick museum was long a popular seasonal attraction to locals and visitors alike. That is, until ELC pencilnecks got around to inspecting the building and decided that it had been neglected too long, heating wasn’t up to code, didn’t meet prevailing fire regulations, blah, blah, blah and locked the building two weeks before its Easter 2002 opening with the exhibits already installed and ready. What was then the Friends of N. Berwick Museum (FNBM) had organised regular talks raised funds and generally lobbied against a council museum service in Haddington who seemed more keen on nationally touring exhibits than anything celebrating the town and its culture. The also seemed singularly indifferent to the museum’s closure, declined to slim down staff so that a budget for re-opening might be accumulated, focusing instead on the Mining Museum and their new plaything in the John Gray Centre. Not so the Friends, who closed ranks, kept up their lecture series and fundraising against the day when something substantial might be done to re-open. The first glimmer was when a new ELC administration slotted capital into a budget year to start the process so that actual work began in 2011 and the building re-opened in Spring of 2013. Chalk one up to the community for having both vision and perseverance. Perhaps best of all, both remit and name were changed into the Coastal Communities Museum (CCM) so that the whole catchment area of NB High School from Whitekirk to Gosford was included. 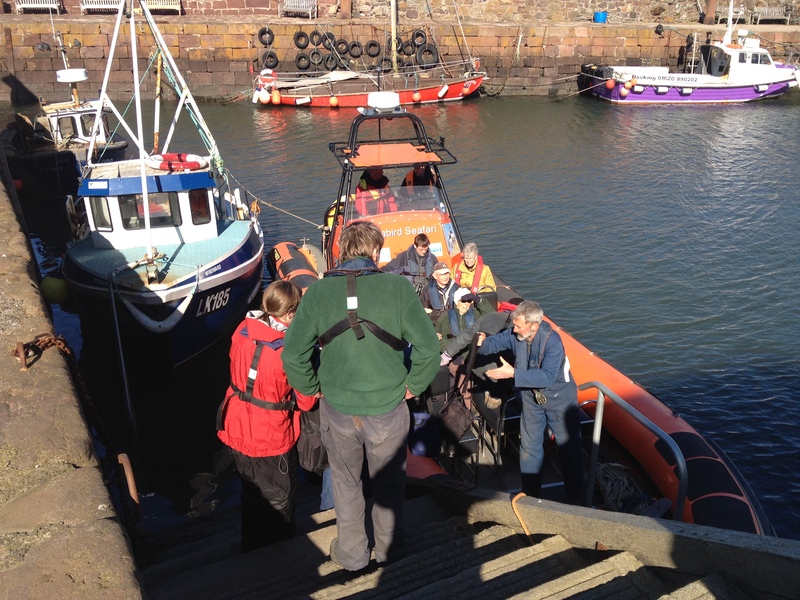 The Friends changed accordingly into FCCM but kept up their excellent work of spreading the word among local residents and helping recruit volunteers to provide staff to keep it open. So, when asked to make a presentation, it seemed only fair to examine the much wider territory the CCM represents. Searching for a way that was not simply a compendium of packet histories of the town and various villages that comprise the council’s “North Berwick Coastal ward” (or, as I prefer to describe it with a nod to our maritime neighbours across in Fife, “the North Neuk”), it seemed that maritime theme might give a new slant on some very old stories. And so it was. Cramming what should have been at least an hour’s material into less than 45 minutes, we swam our way from Kilspindie to Belhaven, looking at this 20km of spectacular and varied coastline from the sea—as people living here when it first became a part of Scotland 1,000 years ago must have done. The joy of such an expedition is novelty and feeling of exploration. While there are books about the land, very little describes the shore or the sea itself. So we visited the once-magnificent but now gone castles of Kilspindie and Luffness, splashed across a much more extensive Aberlady Bay to find the X-craft submarines half-buried in the sand, explored Jovie’s Neuk and its long-gone iron workings as Nigel Tranter once did and imagined the disaster that covered the original Gullane with sand so that the parish church moved to Dirleton. 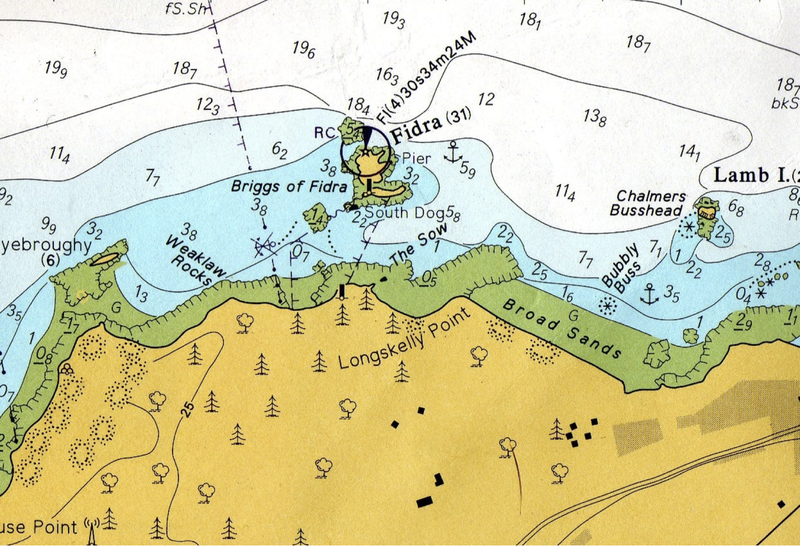 Were the Brigs of Fidra once an actual wooden bridge from the shore? Was there a stave fort atop Castle Tarbet? What other ancient buildings beside the solitary wall remaining of St Nicholas chapel did Fidra have? Then, detouring to the 3,000-ton wreck of Sein Majestäts Kreuzer München just a few miles north, we then visit thousands of guillemots crowded on the Lamb and ponder if there might indeed be treasure that Uri Geller sought when he bought the island and spent the night there in search three years ago. Past the piece of Philadelphia on Broadsands (USS Stockton a.k.a. HMS Ludlow) expended there as a target for shipping strike training Beaufighters out of RAF East Fortune and on to the Bull—closest wreck to NB, lying in 25m of water only 200m to the north of Craiganteuch. Inland of that is the beautiful red/green/ochre seaweed garden off Swinie Craig that leads over boulders to the swaying kelp forests of the Maiden’s Foot and The Sisters where our fishermen are forever finding lobsters. Out at Craigleith, the seals have finished pupping and there are few other residents besides gulls, shags and cormorants. This is the time of year John Hunt and his ‘mallow bashing’ squads are out there hacking down the Bass Mallow invaders so that puffins can easily get to their burrows to bring up their young next season. As a result, their numbers are up—as are the rabbits who also help by snacking on the seedlings. East past the Red Leck, once quarried because its thermal properties make it the perfect over lining there is a wilderness of skerries and kelp to bring you to the long jagged lava flow of the Leithies and the fractured coast beyond where sandy bottoms favour crabs and more kelp makes it another target area for fishermen. 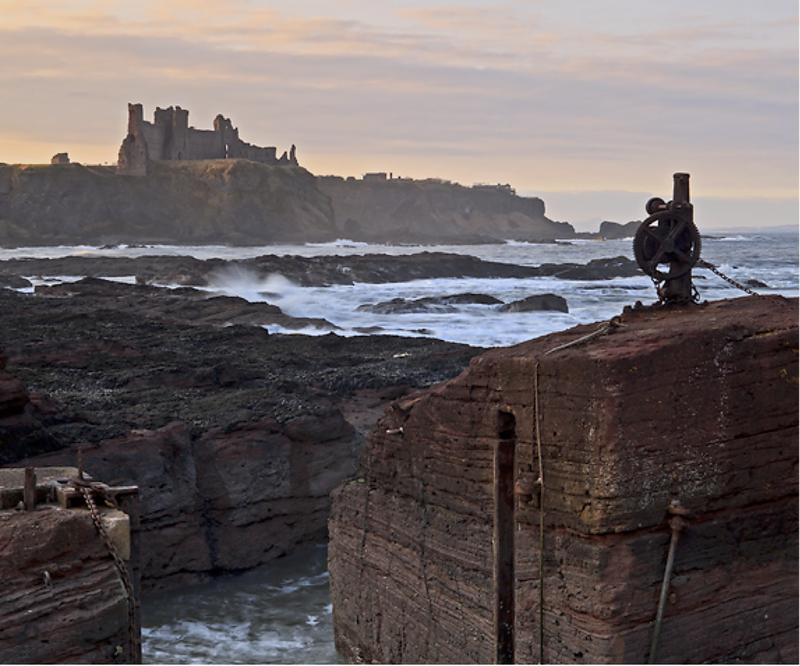 Past the hidden and almost forgotten village of Canty Bay, round Gin Head are the remains of a bustling port beneath the beetling battlements of Tantallon and the smallest harbour in Scotland carved out of the massive red lump of the Gegan. We are now at our favourite secret beach of Seacliff with its acres of curved sand, fine views, caves, ruined 15th and 18th centry mansions andgrey seals hauled out on St Baldred’s Boat. After the long and usually deserted beach of Peffer Sands, you round Whitberry Point into the calm of Belhaven Bay, separated from the wide expanse of the beach by the huge sweep of the Tyne entering the sea. Although Aberlady is rightly favoured by birdwatchers, those who find Sandy Hirst and its long empty stretch of shoreline are seldom disappointed.